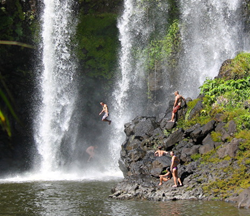 Skyline Eco-Adventures, Hawaii’s award-winning zipline company and operator of the first zipline course in the United States, is launching a new Zip-n-Dip Tour option at its Akaka Falls location on the Big Island on June1, 2014. Take the plunge and cool off after the seven-line Akaka Falls zipline adventure, which includes up to 3 hours of waterfalls and spectacular ocean and mountain views, including the only zipline in Hawaii that soars over a 250-foot waterfall. After each 10 a.m. zipline tour, Zip-n-Dip Tour guests will have hours of access to Skyline’s privately owned waterfall swim location just minutes away from the course. Enjoy a swim by the 50-foot waterfall, along with a picnic lunch and use of water shoes. The new Zip-n-Dip Tour will be offered every day from June through August for an additional $70 per person. Zipline tours start at $159.33 per person after 10 percent off when booking online at http://www.zipline.com. Skyline Eco-Adventures was recently selected among more than 100,000 picks in HAWAI‘I Magazine’s second-annual Reader’s Choice Awards, earning top honors in three categories: #1 Zipline Company; #1 Zipline Course, Ka’anapali, Maui and #1 Land Activity/Adventure Tour Company. This spring, Skyline Eco-Adventures was named among Hawaii Business magazine’s 2014 Best Places to Work in Hawaii. It is the sixth consecutive year that the company has won this award. Skyline Eco-Adventures is a leading commercial zipline company that thrills more than 60,000 guests annually with “knock-your-socks-off” experiences. As the first commercial zipline operator in the United States, Skyline also specializes in the comprehensive design, development and operation of world-class zipline adventures. Skyline operates two Maui zipline tours at Ka‘anapali and Haleakala, in addition to the Akaka Falls Skyline Adventure on Hawaii Island, and the Poipu Skyline Adventure on Kauai. Call (888) TO-GO-ZIP or visit http://www.zipline.com.